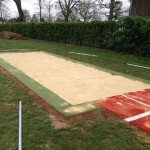 We offer specialist high jump construction services for many outdoor athletics facilities across the UK. This can be done in a number of designs and surface types to suit different performance qualities. 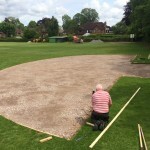 Our team can complete the full process from start to finish including preparing the groundworks and fitting the chosen surfacing. Be sure to contact us straight away if you would like an idea of the costs for installing a facility like this at your school or local sports club. We would be happy to speak to you and offer some more advice on the choice of products we can install, and also provide you with a quote. Our experts have carried out many of these projects at various locations, so we have plenty of experience in designing the surfaces to suit each client. When installing any athletics surface it’s important to assess all the options and variables first, the same applies when building a high jump track. As an experienced contractor working with organisations throughout the UK, we have dealt with many projects which involved the installation of sports facilities. These include high jumping areas as well as other athletics surfaces such as full sized running tracks and long jump run ups. The specification and costs for each build will vary so we need to take a lot of information into account before offering a price and starting the work. If you can let us know the dimensions of the proposed area, along with your location, we’ll be able to provide the most accurate quote. This is because the size obviously affects price because of the amount of materials needed, and we need to account for transport costs to wherever the project is taking place. We’ll try to make our quote as cost effective as possible for you, but please let us know if you need to stick to a specific budget. The main factor to consider with this type of construction work is the type of surface you choose to have installed. 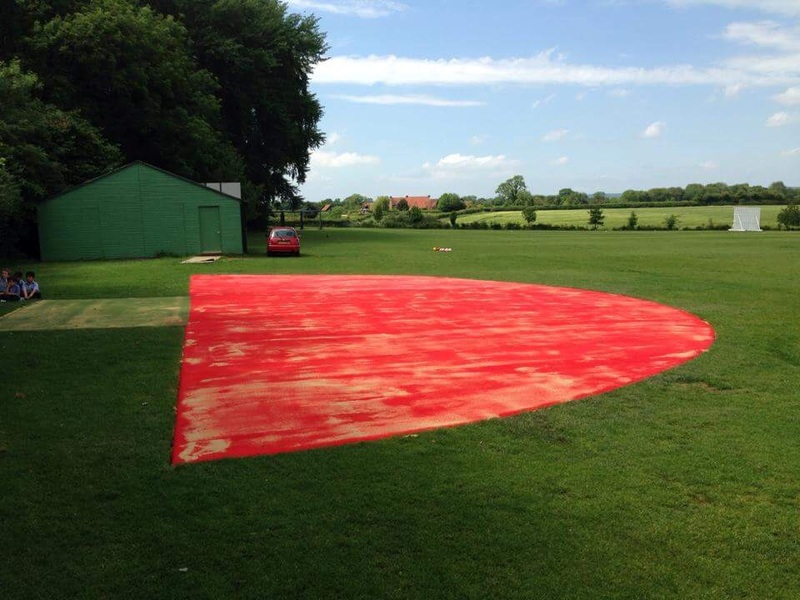 We can provide two options for this sort of area, the first is a Multisport synthetic specification for recreational and practise use, and the second is a polymeric surface for professional and competitive use. For a school facility which is just used in lessons and for extracurricular activities, the Multisport synthetic carpet will be the most cost effective option as it’s very versatile and suitable for all weather use. 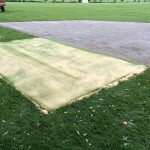 This fake turf specification is installed by rolling out the carpet to the required shape on a prepared macadam sub base. If you are carrying out a high jump construction for a facility which requires IAAF competitive and international standards, the polymeric rubber will be used. For this installation our team will lay out a mixture of EPDM rubber granules and a binder which is screeded to give a flawless finish. Other specifications of polymeric athletics surfacing can include a sandwich system, or textured spray where an SBR base is installed and a spray of EPDM is applied on top. Because the rubber run up surface has IAAF approved qualities, it comes at a premium price compared to the needlepunch turf, but we will provide a quote for both if you get in touch with us through our enquiry form. 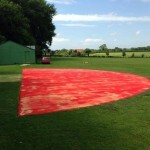 For most high jump fan installation works, the process will begin by preparing the foundations and laying a sub base. 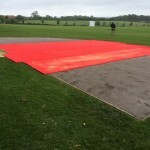 Having a strong and durable sub base is vital with all sports surfaces as it will ensure that the area is safe, the ground is even and the playing qualities last all year round. 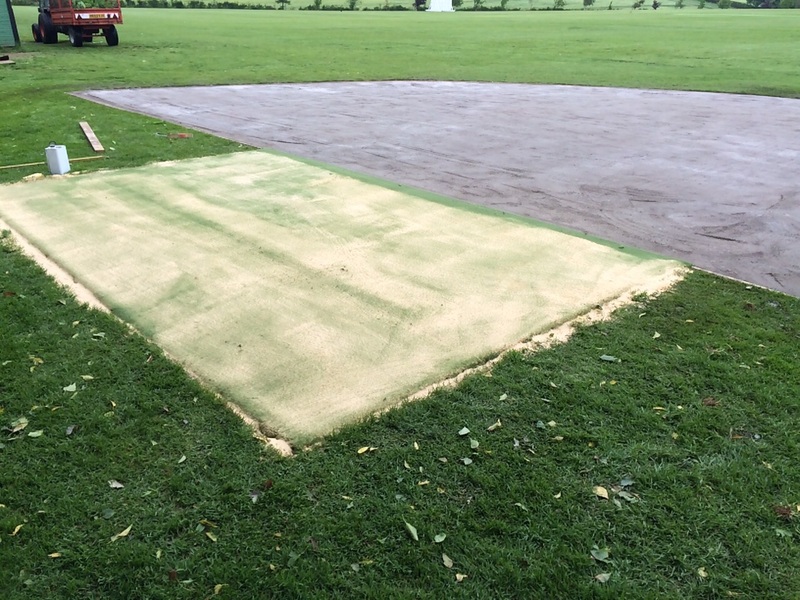 Once our specialist installers have completed the groundworks, they will then carry out the surface construction in the chosen design of polymeric rubber or Multisport turf. 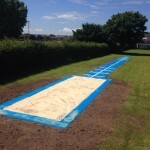 Both of these athletics surfacing types come in a variety of colour choices so each school, college, university and club can decide on a bespoke design for their run up area. The full high jump construction process is outlined in this video below where we completed a project at a school in Buckinghamshire. 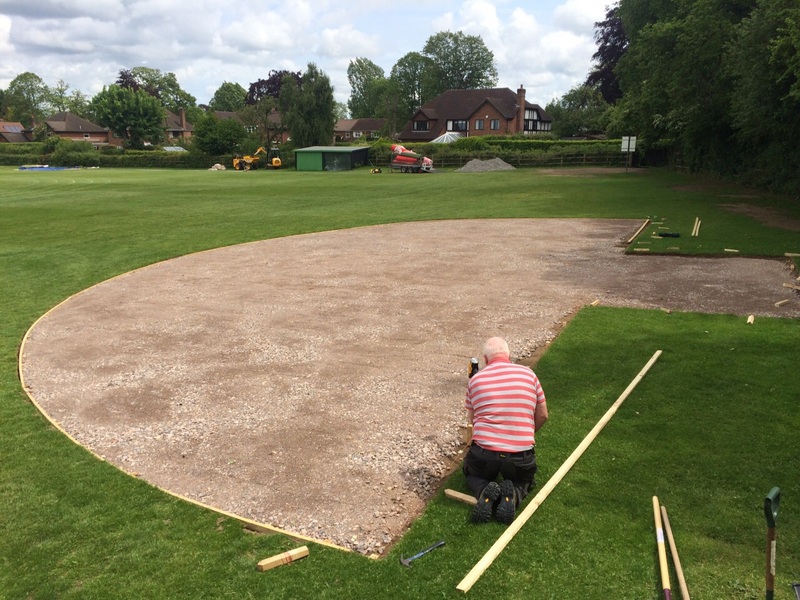 This involved setting up the groundworks, installing a sub base and laying the surface for the run up area. The clients chose the needlepunch synthetic turf specification as this was for a recreational school track to use in training and lessons. Additional equipment and accessories are often included with the high jump fan installation so that users can make the most of their facility. 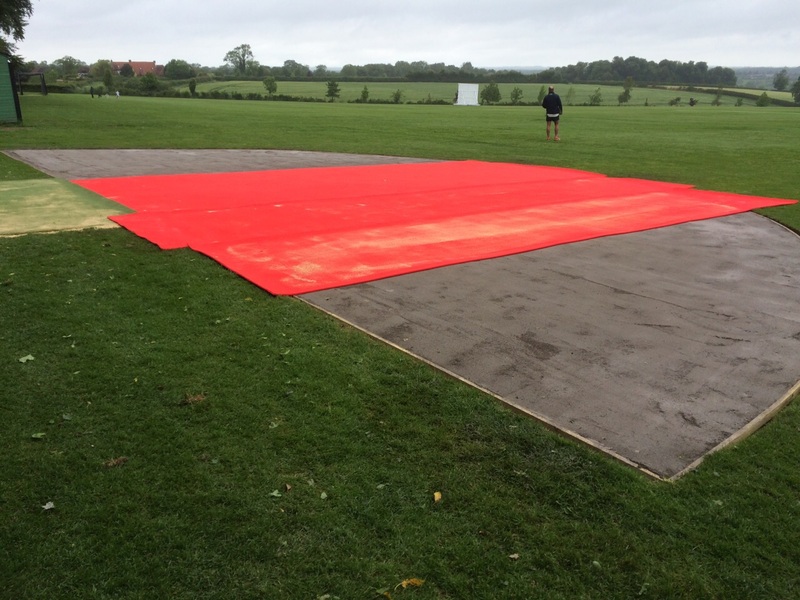 The extras we offer as a professional contractor include specialist safety mats, crossbars and measuring stands. All of these are supplied to meet a range of standards from IAAF professional use to recreational school areas. If you are interested in having sports fencing installed with your athletics surface, we also carry out this work so click here to find out more on the designs and prices. We understand that each client is different and the requirements will vary from project to project, we can offer professional advice every step of the way. Simply contact us through the quick form on this page and we’ll be in touch to discuss costs and surface types for your high jump construction. Make sure to let us know if you have any budget requirements to stick to, or if you’re looking for a particular design for the facility. We’ll do our best to incorporate this when putting together our quote and design, making sure that the project is exactly what you want.